Natural Broad Spectrum Lip Balm | Raining Rose Lip Balms | Custom Lip Balms with Zinc Oxide | Adco Marketing. Natural lip balms with full cancer protection! 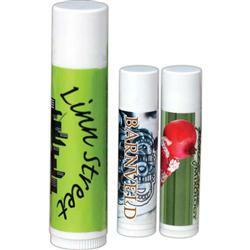 Protect your clients and your lips with this smooth silk sweet moist lip balm. Fancy feel, worth the extra few cents for sure! 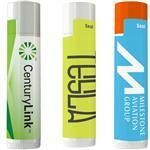 The Broad Spectrum rating makes this lip balm one of a kind in the promotional industry. It is made with beeswax, organic sunflower oil, vitamin E, organic extra virgin olive oil, and aloe vera, creating a premium blend that is of the highest retail quality, and sure to delight. If you don’t see “Broad Spectrum” on the label, you’re NOT protected against the aging and cancer-causing impact of UVA rays. Available Colors: Full Color Imprint. Production Times Available: Standard 5 Day Production. Rush available, please inquire. 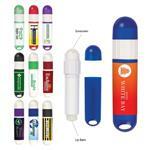 Typical Imprint Area(s): Imprint area: 1.4" x 1.7"
Available Imprint Options: Full Color Imprint.